Fellow fiber fanatics, what would you do if you found yourself with a lovely pile of yarn, and no hook or needles to use it? Such a position I found myself in today at a friend's Baby Shower. All these lovely bits of yarn wasted on a a game of 'Estimate The Size of Mama's Belly'. Blues and Greens, my favorite colors. I just could not let them be tossed. First I made a little yarn baby for the guest of honor. Then I decided to tie the leftover bits into a ball to make a hat. But alas, no hook. I ran out to the car, no hook... I looked around the kitchen, found a pen and pencil holder. 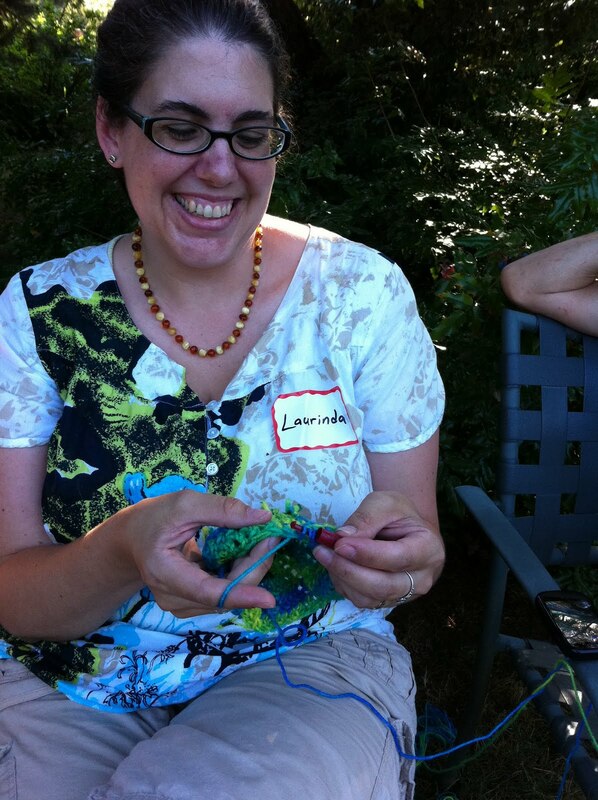 I thought maybe I could use a pen or something, but I am simply not a knitter, I need a hook. I decided to try the cap off one of the pens and realized I could bend the tip to create a hook of sorts. The work was a bit slow, but it gave my hands something to do while the guest of honor opened her gifts. 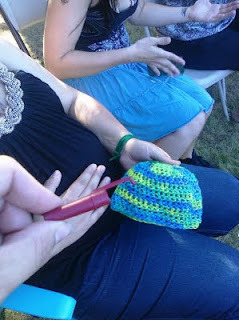 By the end of the shower I presented the expectant mama with a crocheted hat for her eagerly awaited babe. So, if you are ever in an emergency situation, keep in mind that pen caps can be very useful. Shut the front door. That is awesome! WOW just grabbed a pen cap and the end bent so could be used as a crochet hook with just my fingers/finger nail. Great idea. I have been on trips and lost my hook and never ever would have thought to grab a pen cap. I will from now on. YOU ARE AWESOME FOR SHARING! Aw, thanks! 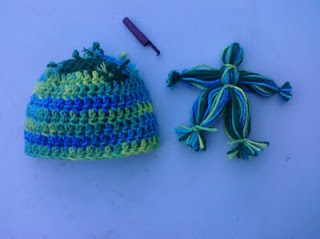 Since I posted this, I've made two more scrap hats at other baby showers (though I almost always have a crochet hook or 5 in my bag these days).